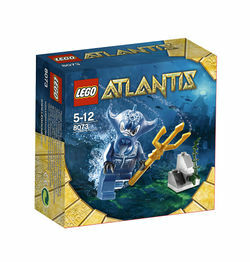 8073 Manta Warrior is a LEGO Atlantis set released in December 2009. Included is one Manta Warrior minifigure. It includes 13 pieces. As this was a small set, it was released alongside 8072 Sea Jet. The set consists of an Atlantis Warrior, and a small rock structure. The rock is made of several slanted grey bricks set upon a 2X3 grey plate. A small piece of kelp is also included. The Manta Warrior has unprinted dark blue legs. It's body is also dark blue, and printed with several light blue muscles. The warrior's head is grey, and printed with massive black eyes. The warrior wears a helmet styled to look like a manta-ray. This is one of only two Atlantis impulse sets released in 2010. This and 8072 Sea Jet are the only Atlantis sets without a key. The included trident was a new piece made exclusively for the Atlantis series. This is a description taken from LEGO.com. Please do not modify it. (visit this item's product page) Beware this undersea warrior of Atlantis! Treasure-seekers beware – lurking behind this seaweed-covered rock is a fearsome Manta Warrior, prepared to battle anyone who dares to search for the long-lost sunken city of Atlantis! Includes Manta Warrior with trident. Set includes Manta Warrior minifigure and seaweed-covered rock! Manta Warrior is armed with a fierce trident! Facts about "8073 Manta Warrior"
Beware this undersea warrior of Atlantis!